Real race car steering wheel rims on Xbox One! 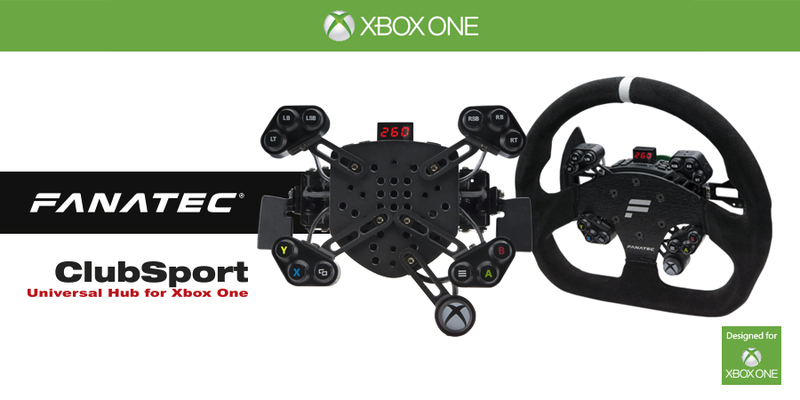 Landshut, 2.4.2015 - Fanatec is proud to announce the Universal Hub for Xbox One. This controller takes modularity and realism to a whole new level. These wheel rims have automotive quality and could be used in real race cars. They all are covered in genuine leather and come in different diameters. But you can also purchase the Universal Hub for Xbox One without a wheel rim and use any wheel rim you want or already own. It is comparable to real car steering wheels from famous brands like SPARCO, MOMO or OMP. With every Universal Hub for Xbox One, you have the option to configure the button layout to your preference and the position and angle of every button can also be adjusted. You can also take off some of the small button boxes without losing functionality as all buttons are also on top of the hub casing. You have the choice of two different sizes and styles of paddle shifters and even those are fully adjustable. Just like many other Fanatec steering wheels, it also comes with a Tuning LED display (detachable) to show telemetry info or change wheel settings on the fly. It also comes with the genius 7-way FunkySwitch™ encoder. The Universal Hub for Xbox One can be used on the ClubSport Wheel Base V2 and on some upcoming wheel bases from Fanatec. As soon as you connect the Universal Hub for Xbox One, the base will be switched into Xbox One mode using force feedback protocol with the new and advanced equation system. There is also a hot-key to use the Universal Hub for Xbox One on PC and other gaming platforms. It is the most compatible product on the market! There are several more wheel bases at various price points planned to be released and there will also be another steering wheel for Xbox One to be announced later this year which will be targeted to a broader audience at a much lower price point. The Universal Hub for Xbox One will be available on May 28th in Europe, USA, Australia and Japan. You can pre-order this product right away only on www.Fanatec.com. Great to see a decent wheel for Xbone, but here is my question for Thomas. When I bought my CSWB V2 I bought the universal hub and GT AU wheel rim. So is there a way to just upgrade my universal hub to suit the xbone rather than ending up with 2 universal hubs. If I had known that this was the way it would come around I would have bought a Formula wheel when I bought the CSWB V2 instead of the universal hub. Just off to do some shopping! it is not possible to make an upgrade as we cannot sell the electronics separately. Thomas, is it on the fanatec.com yet? Can't see it! When will we be able to place our pre orders? Thomas, do I understand correctly? coupled with v2 connects and works on PS4 as well - is that coorect? Thomas, your prices om Fanatec.com are higher than listed above. It also makes zero sense ordering a package with wheel and hub as that is more expensive than adding the hub and wheel seperatly. Choose the hub, go to shopping cart, choose the steering wheel - price as advertised above. I just noticed that too? Is there any reason (difference) in the bundle compared to ordering seperetly Thomas? It's not up on Europe sight Thomas...please put it on!!! Guys, I am on EU site and all works correctly! Yes it is. Refresh the page and you should see it. No worries Thomas just thought I would ask. Pre-order placed. Boy, why those wheels are sooo plain . They are the same rims that have been available for 6+ months. I am not pleased with this announcement, i thought they would be releasing a FOmrula rim with built in Xbox one buttons so it worked like the standard formula rim for the Club Sport Base, i just cant justify paying 300 Euros for set of buttons plus then 130 euros on a very basic rim. Unless Thomas you can confirm that a Formula rim is coming out on the Xbox One for a similar price of the current Black Formula Rim then i will be cancelling my order of the V2 Base. Why not rebuild the BMW rim, for example, with chip and buttons ???? Then we allready could have had it in our hands I guess ??? It doesn't change anything, does it? I think this man is after the same qualities. Xbone hub ordered. Now for the 8 week wait!! As delivery estimated 28th May. I understand you wanting something different. I'm just saying the rims selection should be of no surprise as they are the existing rims. That's all. Just to confirm, if i were to purchase the Xbox one hub this would enable me to use my formula carbon rim for it? No this won't work with existing quick release rims. Screw attachment rims only. So just to be sure there is no formula one rim? The flat 1 or GT rim is the best option? Surely the best thing to do was concentrate efforts on the universal hub to give people a wider selection of wheels?! I understand that a formula rim would be nice but initially to please the majority this has to be the correct thing for Thomas to have done. It's all good. Just want to be sure of the best rim to choose for playing Forza,PCars,etc. A cheaper plastic F1 style rim (like the 99€ CSR-E Version) In fact... Im so sure of it, I'm not ordering this as it's not right for me. Considering the rim is technically not even quick release either, as I will need to sit with a screw driver and unscrew 5 hex screws from the rim, remove it and then re screw in 5 more to the alternate rim if I want to change cars. I like the current quick release system and I think that suits my needs far more than this. Plus what's with the strange ambiguity re: the pricing? Why is it €50 more expensive to buy it in a bundle? Bundles are supposed to be cheaper AND they don't match the price posted by Thomas? Will the Handbrake work with the Xbox One wheel and V2 Wheel base? Universal Hub für Xbox One und das GT-Lenkrad wurden gerade von mir im Shop geordert. Schön das es im Laufe des Jahres auch noch ein günstigeres Produkt geben wird, vermutlich zum Release von Forza 6 ....wobei das reine Spekulation von meiner Seite ist. Da ich mich aber mit der schon gekauften V2 Base für das Highlight aus eurem Sortiment entschieden habe, ist dieses kommende Produkt keine Option mehr. Zu extrem war außerdem der Sprung von meinem alten CSR zur V2 Base..... jedenfalls das was ich am PC schon testen konnte. Hoffe das dieses grandiose Forcefeedback so auch auf der Xbox One übertragen werden konnte. i just bought a hub around a month ago, will it work with an xbox? Thomas will this Hub work on XB360??? Your post says it works on "XB1, PC and there is a Hot Button to Make it Wirk on other Platforms as well". ok i have a queation, how does the rim work? does the hub access the XB1 wirelessly or through the usb port on the base? how is the FFB communicated? will the wheel bases need an update to incorporate the FFB protocol for the XB1? Plus what's with the strange ambiguity re: the pricing? Why is it €50 more expensive to buy it in a bundle? Bundles are supposed to be cheaper ANDROID they don't match the price posted by Thomas? I disagree with F1 rim coming next. IMO it will be along the lines of the BMW or PORSCHE rim. That would appeal to a much broader customer base. And CSRE F1 rim isn't plastic it's exactly like the CS formula rim but not QR. It just got marked down from $179. i wish it was the bmw or porsche wheel, while the universal wheel hub allows more options, it still has more basic rims and is more difficult to configure. This is also my question... thomas? Regarding the xbox one, will microsoft need to release a dashboard/software update so the console will recognize the xbox one wheel rim + base or is it compatible from day one? Console people want plug and play that's why the like consoles. Would have thought the f1 rim and gt rim was the way to go. PC Users like to mod everything so the hub is right up their street. While im Happy that the XB1 Wheel Hub is Finaly Here... I Was Hoping For a Stand alone Rim More like the Porsche and F1 Rims. I dont think i will be ordering this as the Buttons on the Hub are Basicaly Useless...IE: When using the v2 with PS3 or XB1 with the TX i just keep a Controler Next to me for Easy Menue Navigation. I think i will wait for the Stand alone Rims and just Play on PS4 with the Porsche and F1 wheel i Have for Now...and just like i thought the Price of the Rim + the Hub is the Price of a PS4 and with the Hub set up i will Need 2 Hubs to be able to Truely Quick Change from GT to F1 style wheel...FM6 is Not Coming out any time soon so i Have alot of time to Save Cash Flow for when the Next wheels are Released.